This started as an early morning post because I was too uncomfortable to sleep this morning, but then breakfast arrived 🙂 It all appears to have gone well yesterday but it’s going to take a while to feel better. This cushion was last minute birthday present idea because I had no clues what to buy and had been so distracted by medical matters the date crept up on me! 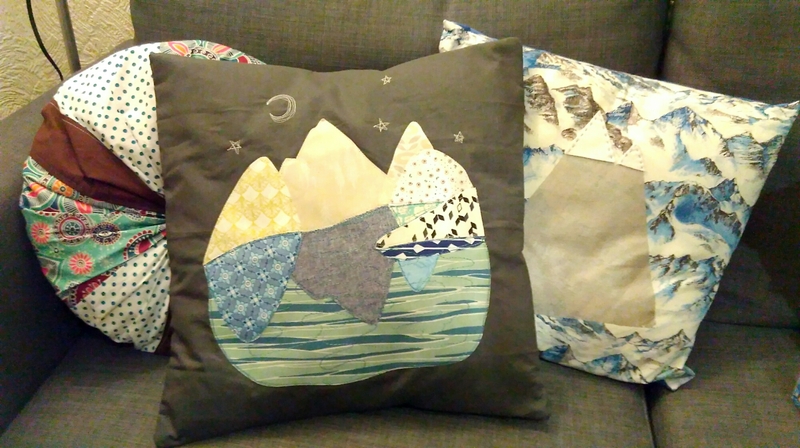 Here’s the cushion, posing on my sofa with my other wonky mountain 🙂 It’s my largest machine applique/ embroidery project so far, I’ve only made postcards before, but creating the pattern and choosing fabrics is still the hardest part. I didn’t take any close up photos to properly show the freehand sewing machine embroidery. The pieces were cut out of a hurriedly made pattern and attached to the cushion with ‘heat and bond’. I then freehand stitched around all of the edges a few times, for security and I like the look of several rounds of overlapping stitches – and I can never get the same line twice! I also embroidered curves across the water parts to suggest ripples, I knew I’d bought that blue green variegated cotton for a reason 🙂 The sky looked a little empty, so because it’s a dark cotton I added the moon and a few stars. If I had a bit longer I think I’d add more details to the view. The entire cushion is made of scraps, and I don’t have a huge amount of suitable fabric, so the back is made of dark indigo denim to keep with the water theme. At least it all turned out big enough and just about square! This entry was tagged applique, freehand machine embroidery, sewing. Bookmark the permalink.